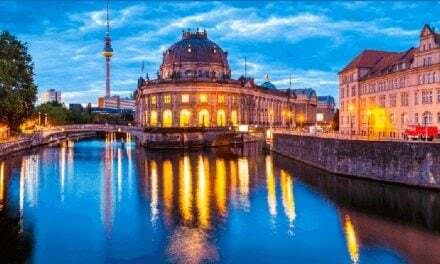 As the burgeoning and bustling capital of Germany, Berlin offers an addicting restaurant scene with any international or trendy cuisine you may desire. 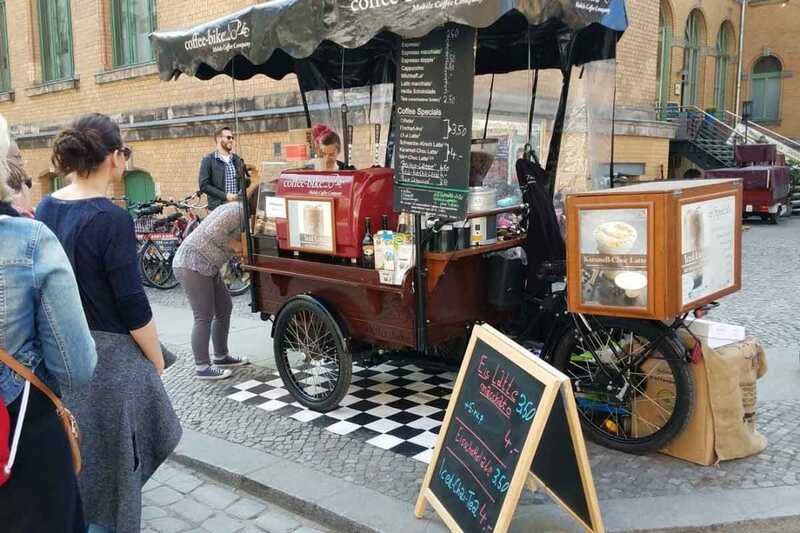 But in keeping with its gritty, artistic ways, Berlin has a superior street food market scene. 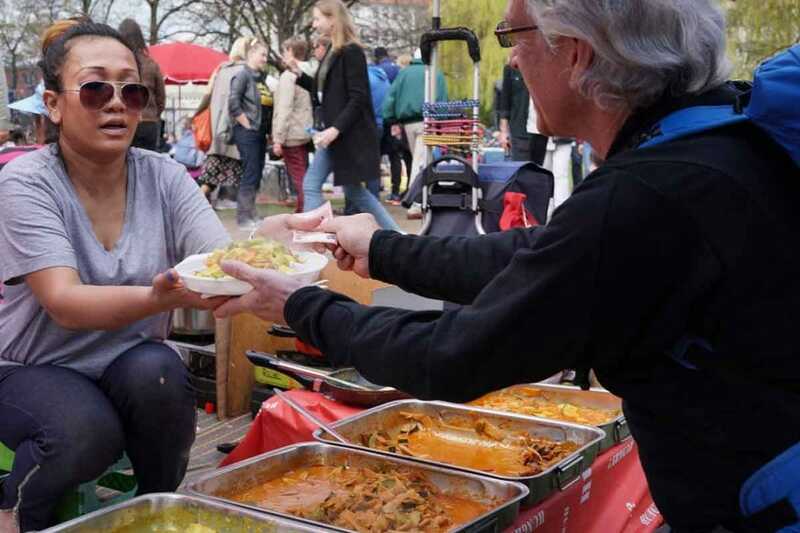 Let’s explore 5 great Berlin street food markets you won’t want to miss. We are ordering them based on the week’s schedule – you wouldn’t want to miss one, now would you? This street market has been a tradition since Turkish families starting coming to Germany some five decades ago. Of course, over the years, it is has developed, grown and become more refined, including not only Turkish food but also German and others. We first visited it in the late 80s, in fact. Feel: Along the street next to a canal, the Turkish Market has a true street market feel. It is not groomed! 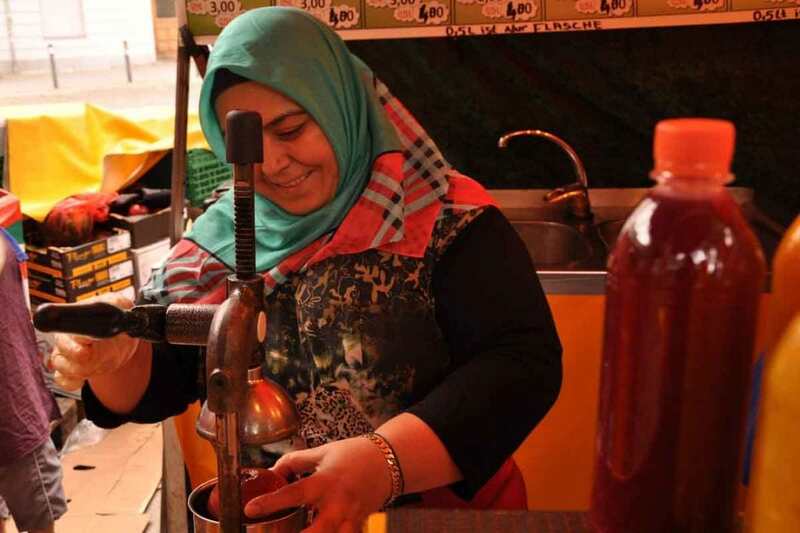 Turkish women mix with tourists and locals. You see serious shoppers and tourists with cameras. Offerings: Great Turkish food, prepared and deli to-go, as well as German baked goods, cheeses and meats. And whatever other vendor decides to show. 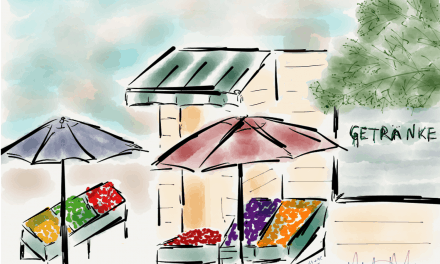 Plus, vegetables, fruit and fresh squeezed juice, as well as notions, fabrics, leather goods, jewelry and you name it. 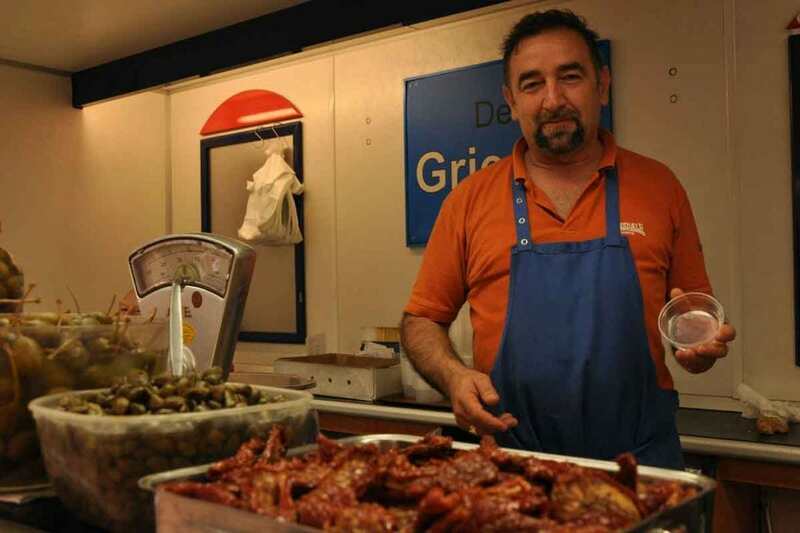 Be sure to say hello to our friend Sammi who sells the most delicious olives, marinated tomatoes plus various dips and goodies from his stand at Berlin markets including the Turkish Market and Winterfeldplatz. 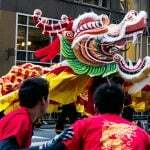 The draw: Go for lunch or dinner, shop for trinkets, be entertained by the barking vendors, and enjoy the mix of cultures. Good prices too. Hours: Tuesday and Friday, 11 a.m. to 6:30 p.m., shorter hours in colder months. Closed on some holidays or days changed. Check the website. Getting there: Along the Maybach Ufer, U-Bahn Line 8 (Underground), Station Schönleinstrasse. Mmmmmmm … fresh-squeezed pomegranate juice! Served with a smile. HITT Tip: The fresh-squeezed pomegranate juice toward the far end is to die for. Get a large one and share it. 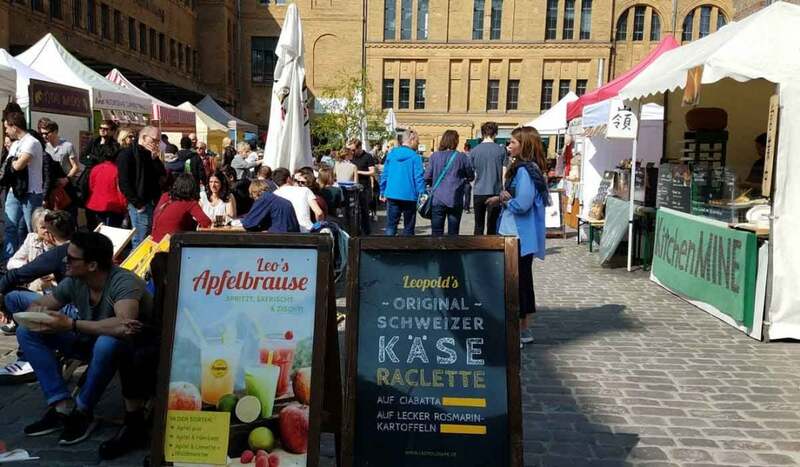 The Markthalle is open Tuesday-Saturday as a regular market – both farmers and other fun stuff — but on Thursday evenings it transforms into “Street Food Thursday,” begun in 2013 as the Berlin street food/food truck scene was catching on. Feel: Thursday evenings is a huge attraction. A real scene to see and be seen, meet with friends for a fine glass of wine (while standing mostly). Very very international. I swear you hear more English than other languages. Offerings: Mind-boggling, really, the types of food, drink and true culinary delights, many of which are really pushing the envelope a bit. Burritos, oysters, burgers, grilled cheese, French cheeses, Sushi, Asian noodles, and much more. 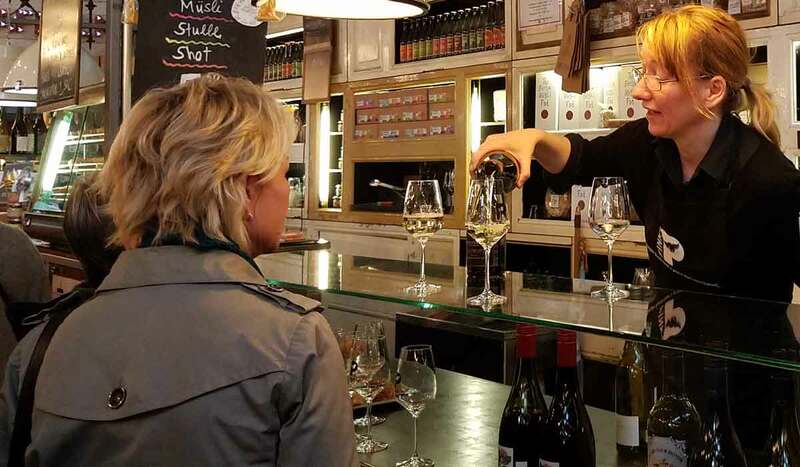 Fine wines, frothy international beers, even a Berlin-area whiskey distillery! The draw: Yes, the food, but it’s not cheap. The big, loud, trendy scene packs ‘em in. 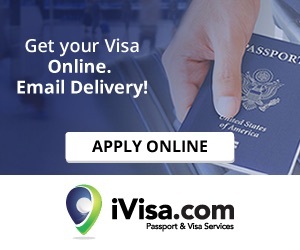 Tantalize your taste buds with a wide variety of international fare. Hours: Thursdays, 5-10 p.m. Check the Facebook page for updates or special events. HITT Tip: This place can be so packed you had better set up a meeting place for you and your companions. Because you will get separated. And it’s so loud there is no guarantee your will hear your phone. 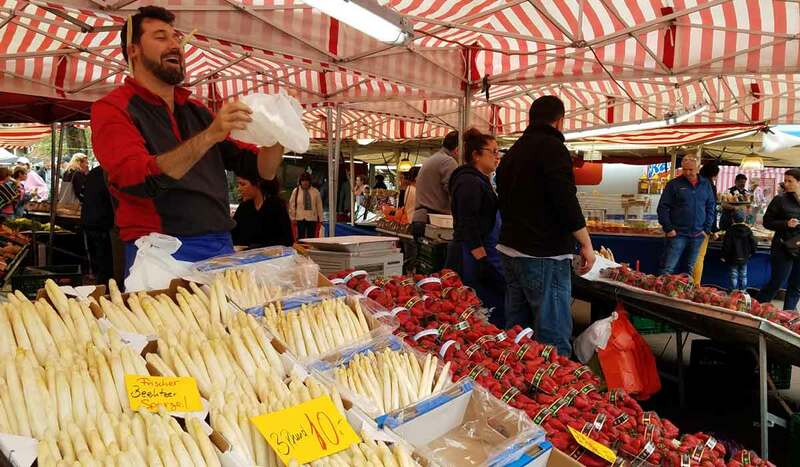 Spargel (white asparagus) season brings out the smiles for vendors and customers at any street food market! This is the real deal weekly farmer’s market that so happens to have a street fair and street food feel too, but all in a true German fashion. 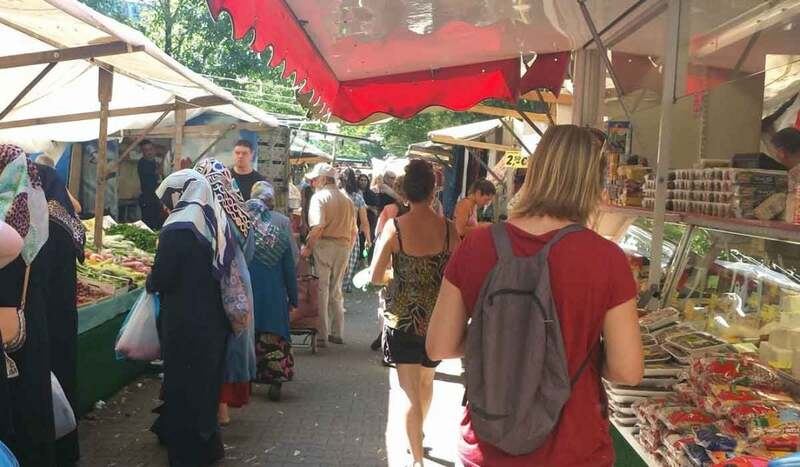 Winterfeldtplatz Market is the largest and most well-known Berlin street market. Feel: German, all the way, but with a nouveau feel. Locals are out shopping for the week, others are dropping in for a little saunter and snack. Offerings: Fruits, vegetables, of course. 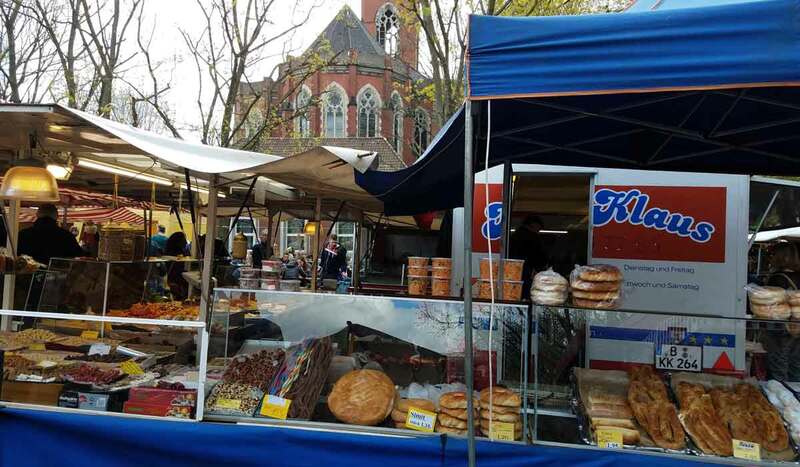 Food stands, of course – lots of German deli specialties, as well as French quiche, Italian specialties, fresh-cooked fish, amazing pastries and desserts, sausages, and all you would expect. Plus, leather goods, clothing and accessories and other street fair paraphernalia. The website lists vendors. The draw: The neighborhood is now quite “in” so the streets are lined with great cafes, boutiques and restaurants. In nice weather, the scene moves outside. 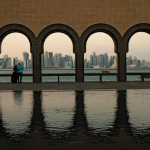 The historic square and area atmosphere can round out your visit. Hours: Saturday, 8 a.m. to 4 p.m. for the true bustle. Also Wednesdays, 8 a.m. to 2 p.m., if you want to stock the fridge or grab a few picnic goodies. 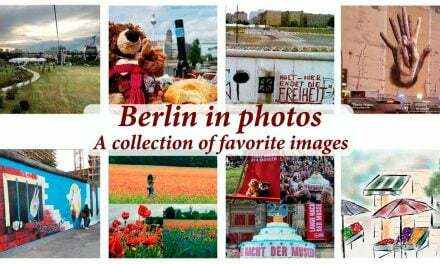 Getting There: Winterfeldtplatz, U-Bahn Lines 1,2,3,4; Station Nollendorfplatz. HITT Tip: If you are a cheesecake fan as I am, then do NOT even think about missing the cheesecake vendor. A small table with a couple of guys selling all kinds of varieties of homemade cheesecakes (apricot, cherry, streusel, etc.). We were so enthralled by the goodies, we didn’t get the name! But this is the only market he does. This street food/food truck gathering happened sporadically for a few years, perhaps only once a month or just in the summer. Since 2015, it is a weekly affair most of the year. Feel: The “Culture Brewery” is a former brewery that has been transformed into a hot spot with stores, a museum, a grocery store, movie theater and a nice courtyard, where of course the food trucks pull in. A much more mellow scene, with young families, couples, groups of friends, but not so many tourists. Tables and benches are set up but seating goes fast in nice weather. Offerings: With the emphasis on food trucks, the offerings are quite American with an international dash – burgers, burritos, pulled pork, sweet potato fries, shave ice, as well as Russian raviolis, Indonesia fare, New Zealand meat pies, etc. The draw: The atmosphere is a mix of historic and modern. 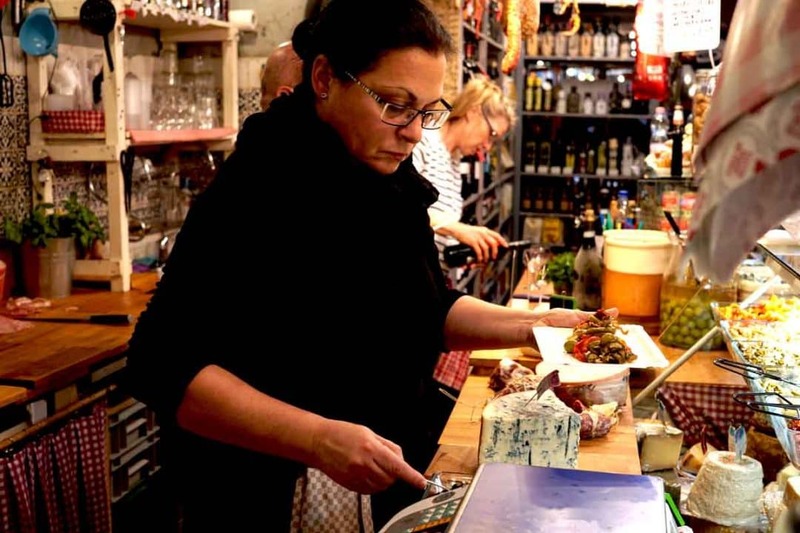 Get your fix of non-German food and hang out for a while. When it’s cold, fire pits are set out, too. Hours: Sundays, 12 noon to 6 p.m., about mid-January to mid-November. Check the website for changes, updates and details. Getting there: Schönhauseralle 36, U-Bahn 2, stations Eberswalderplatz or Senefelderplatz. Michael paying for some delicious Thai curry. You can read about Thai Wiese in my Photographer’s Diary, here. 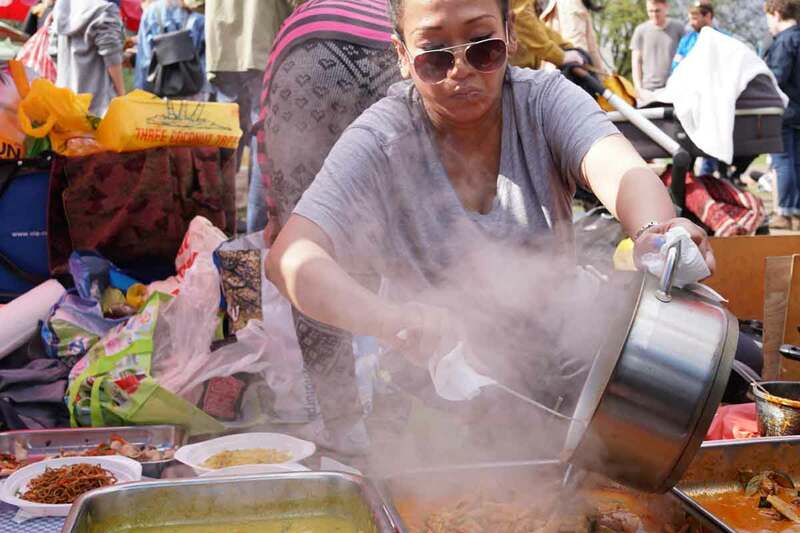 This Berlin street food market began – or so the story goes – when Thai residents started gathering in Preussen Park for their own gatherings to cook, eat and hang out. Locals were intrigued by the food and then the light bulb went off – we could sell it! And so they did. And we thank them for it. Feel: Super casual afternoon in the park. Bring a blanket to sit on, bring your own beverages if you want. Good, cheap, Thai food that satisfies the need for yum. 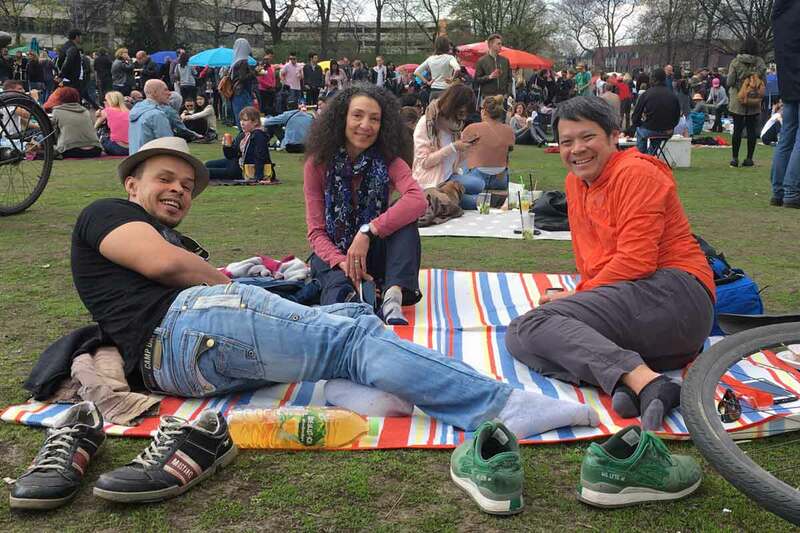 Therese showing how you enjoy “Thai Wiese” … picnic blanket with friends. Offerings: Noodles, salads, dumplings, satays, you name it! There is Thai food here you will likely not find in any restaurant in Berlin or in most other cities. Get a Thai massage even if you are so inclined. The Draw: So casual and fun. Vendors set up on low tables. You wander among them and figure out what you want. 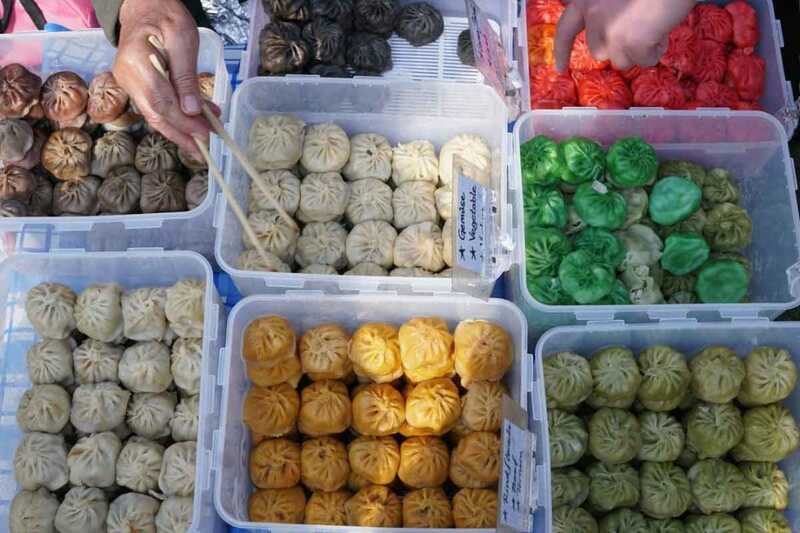 Don’t miss the exuberant man with his homemade array of colorful dumplings with a wide variety of fillings. 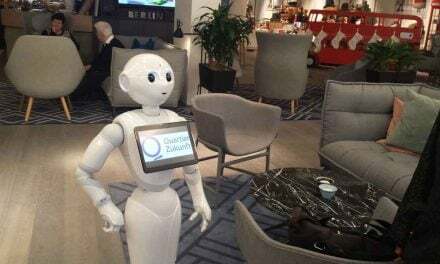 Hours: Quirky. Website says Saturdays and Sundays from about 12 noon to “usually” about 10 p.m. Vendors will just close up and leave when they run out of food. Bad weather will cancel the event. 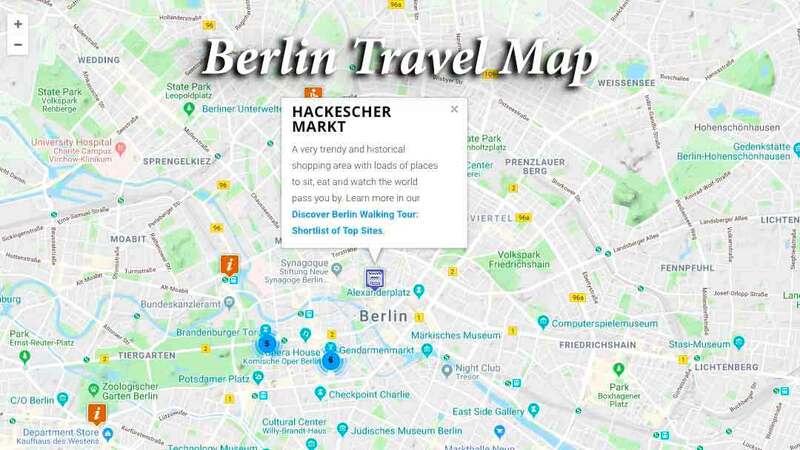 HITT Tip: Use the BVG website (Berlin public transportation) to help find your way to any of the above markets. We have only named the closet underground station, but there are of course streetcars, trams and buses available in most cases. Heads up! 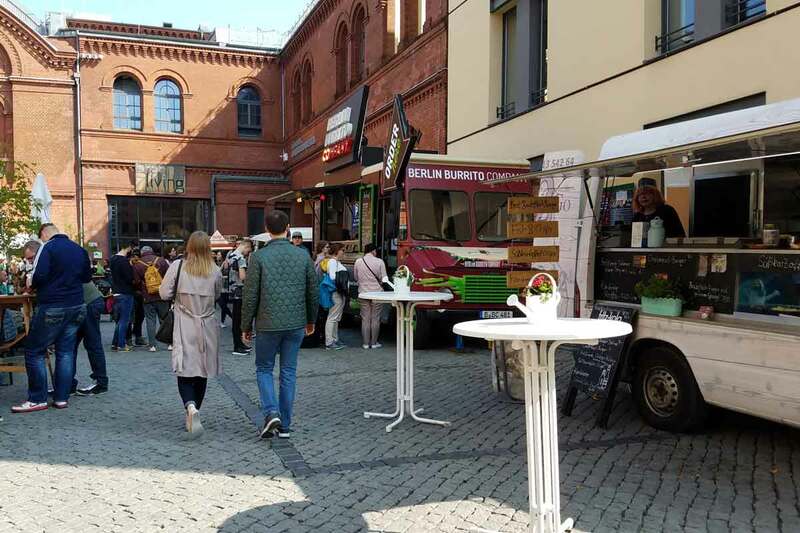 This information on the Berlin Street Food market scene was accurate when we published it on HI Travel Tales, but, as we know, traveling is all about changes (and inflation, sadly). It is your sole responsibility to confirm prices, transportation schedules, hours of operation, safety and health considerations, and any other important details before your adventure.